Aldi has pulled out all of the stops with this wine pop up in east London. Instead of going for the rustic/french interior many wine stores opt for, Aldi has adopted a futuristic theme, with glass, minimalism and rows of tablets. 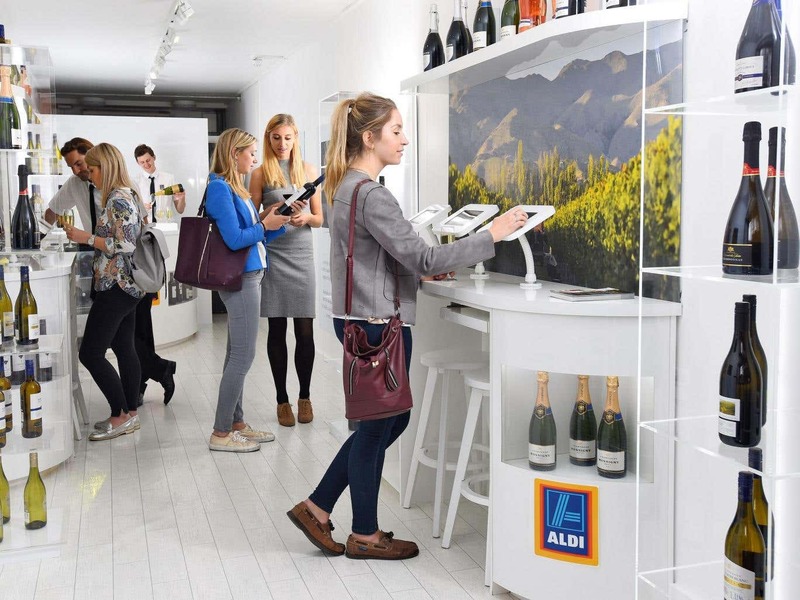 The pop up is the first of its kind from Aldi and has been created in response to Aldi’s increasingly popular wine range and to celebrate the launch of the supermarket giant’s e-commerce site. Located in Shoreditch’s Boxpark, the shop will be open from tomorrow (Thursday 26th May) to the public until Saturday 28th May, as part of London Wine Week. Customers will be able to try before they buy online (the tablets make sense now) with a resident Master of Wine – one of only 338 in the world – and sommeliers on hand to guide wine lovers through Aldi’s award-winning range. Visitors wanting to up their wine knowledge can participate in various free masterclasses on a first come, first serve basis (10 spaces available per session) including an introduction to pairing wine with cheese, and how to identify characteristics of new world verses old world wines. Anything that celebrates the glorious substance that is wine, I am completely OK with, well done Aldi!